Digital DC Comics Flying to a Device Near You! DC Comics has (finally) jumped onto the digital bandwagon and is now publishing online versions of popular series for the PSP Comics Store, as well as other electronic readers. Digital comics have been a big deal lately, but DC Comics has been a notable absence from the movement. While comic fans have been able to fire up their favorite books from publishers like Marvel, Dark Horse, Image, and IDW on their PSPs, iPhones, and iPads, many have wondered why none of DC's flagship titles have been available. As of this morning, however, this is no longer the case, as DC has announced that it's not only going digital, but it's also starting out with a healthy amount of content. 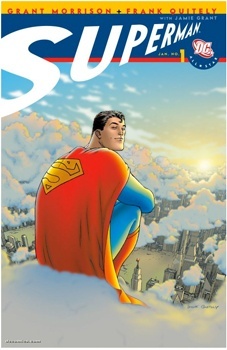 Over 80 different DC titles are now available, priced between $0.99 and $2.99. The comics include some of the biggest storylines in recent years, like "Hush" from Batman and "Rebirth" from Green Lantern. Not only that, but these comics also include lines from the Wildstorm imprint, which publishes a ton of videogame-based comics like God of War and Resistance. Readers might also want to check out Victorian Undead, which was one of my favorite miniseries of the past year. While DC was quick to announce its arrival on the PlayStation Network (presumably because of DC Universe Online's impending launch), ComiXology also announced the lineup on its digital reader application via an email this morning. This means that if can read a DC comic on your iPhone or iPad if you'd rather not use your PSP. DC seems more focused on digitizing back issues at the moment, but it's also providing a ten page preview of this month's Adventures of Superman #700, which marks the beginning of J. Michael Straczynski's writing run on the comic.